Graceland University is a community dedicated to exceptional higher education. It is grounded in the liberal arts and dedicated to providing the progressive academic needs of the 21st century student. Founded in 1895, and sponsored by the Community of Christ, Graceland University is more than just a school. It is a community of passionate, caring and dedicated individuals who put their relationships with students first. The active Graceland alumni network reaches far beyond a student’s time on campus. During SPECTACULAR approximately 1,100 campers and their leaders gather at Graceland University for the largest annual gathering of youth in the Community of Christ. During the week campers can look forward to sharing in all avenues of the SPEC experience - service projects, communication workshops, basketball, musical instruction, table tennis, stage production, worship, delegation devotions, volleyball, tie-dying, cotton candy, discussions about dating and relationships, learning more about our Creator, soccer, and much, much more. 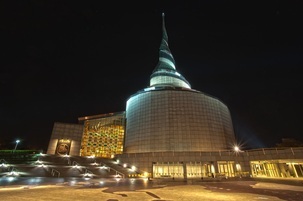 The Daily Prayer for Peace worship service is held at 1:00 p.m. central time, 365 days a year at Community of Christ Temple, Independence, Missouri. Each Sunday we pray for a different nation in our world. Please click below to learn more.